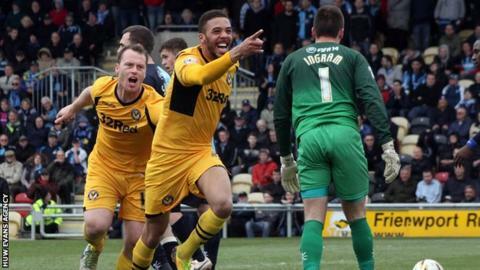 Newport County plunged Wycombe Wanderers deeper into relegation trouble with victory at Rodney Parade. Christian Jolley claimed his first goal since the opening day of an injury-hit season by turning in Ryan Jackson's header from close range. Chris Zebroski added a second within six minutes, sending a rasping shot into the roof of the net from 16 yards. Wycombe are now one place above the drop zone on goal difference, after Northampton Town beat Burton Albion. County's first home win in 10 games lifts them seven points clear of the relegation places with four games of the season remaining. "I'm very happy, it's been a long time coming a win at home. I don't think we've been playing too badly but we've been getting punished for stupid mistakes. "We didn't make the mistakes today and I thought it was quite an accomplished performance really. "We were a little bit nervous at the start and the crowd were a little bit nervous, but we've got to spur them on and they've got to do the same for us." "I didn't like the nerves I saw today. The second half performance was just unrecognisable. "There's a lot of work to do this week and we've got a huge game, not just for Wycombe, but for their careers. The players have got to stand up and be counted. "I don't think we stood up to the challenges today. I thought we were out fought, out thought, and out played, and it's cost us dearly. "We're going to work on what we can this week because I want to put things right." Match ends, Newport County 2, Wycombe Wanderers 0. Second Half ends, Newport County 2, Wycombe Wanderers 0. Substitution, Newport County. Robbie Willmott replaces Rene Howe. Foul by Michael Flynn (Newport County). Dean Morgan (Wycombe Wanderers) wins a free kick in the attacking half. Corner, Newport County. Conceded by Aaron Pierre. Goal! Newport County 2, Wycombe Wanderers 0. Chris Zebroski (Newport County) right footed shot from the centre of the box to the top right corner. Assisted by Rene Howe. Substitution, Wycombe Wanderers. Jo Kuffour replaces Steven Craig. Attempt missed. Lee Minshull (Newport County) header from very close range is close, but misses to the left. Corner, Wycombe Wanderers. Conceded by Max Porter. Goal! Newport County 1, Wycombe Wanderers 0. Christian Jolley (Newport County) right footed shot from very close range to the bottom right corner. Assisted by Ryan Jackson. Corner, Newport County. Conceded by Daniel Rowe. Corner, Wycombe Wanderers. Conceded by Kevin Feely. Attempt saved. Michael Flynn (Newport County) right footed shot from outside the box is saved in the centre of the goal. Substitution, Wycombe Wanderers. Dean Morgan replaces Max Kretzschmar because of an injury. Attempt missed. Lee Minshull (Newport County) right footed shot from the right side of the box is too high. Corner, Newport County. Conceded by Max Kretzschmar. Second Half begins Newport County 0, Wycombe Wanderers 0. First Half ends, Newport County 0, Wycombe Wanderers 0. Corner, Wycombe Wanderers. Conceded by Darcy Blake. Max Kretzschmar (Wycombe Wanderers) wins a free kick on the right wing. Christian Jolley (Newport County) wins a free kick in the attacking half. Foul by Marvin McCoy (Wycombe Wanderers). Attempt missed. Max Porter (Newport County) left footed shot from outside the box misses to the right. Corner, Newport County. Conceded by Stuart Lewis. Corner, Wycombe Wanderers. Conceded by Ian McLoughlin.